Baked Cheesecake with Homemade Strawberry Sauce ... simple, elegant and plain delicious! Cheesecake is one of those delicacies that few could resist. With it's smooth and creamy texture, cheese cake is the perfect dessert when you have company over. If you think that cheesecake is a modern dessert, think again. Cheesecake was a popular dish in ancient Greece and there is even a book developed back then on the art of making cheesecakes. With time, different cheeses were developed and incorporated into the preparation of this notorious dish. These days, cream cheese and ricotta cheese are the most widely used varieties. Cheesecake can be either baked or unbaked, but both types are served cold. There are hundreds of variations for this dish originating from different countries. Personally, I love cheesecake in all forms and types! I have dozens of different cheese cake recipes that I use and look forward to share on dish-away. This is the basic version for the baked cheesecake that I use. From this basic baked cheesecake recipe you can develop different variations and flavors and adapt it to the popular tastes in your country or region. Preheat oven to 325°F. Grease with butter the sides of a 9 inch cheesecake pan. Microwave the butter for 40 seconds, or melt it in a pan on the oven top. Place the crushed digestive biscuits in the cheesecake pan. Pour the melted butter on top and mix with a wooden spoon until all the biscuits are soaked with the butter. With the back of the spoon, press the mixture onto the bottom of the pan. Mix the cream cheese, sugar and vanilla with an electric mixer until smooth with no lumps. Ensure that you beat the cream cheese at the bottom of the bowl. Make sure the cream cheese is at room temperature when you start as this will reduce the amount of time you have to beat the cream which limits the amount of air incorporated into the batter. Having too much air in the batter will result in a grainy texture and the center of the cake may sink. Reduce the speed of the electric mixer to low, mix in the milk until incorporated. Add two eggs, scrape down the edges of the bowl and beat at low speed just until incorporated. Scrape the edges, add the other two eggs and beat at low speed. Scrape the edges. Add the labaneh and flour (sift the flour when adding to prevent the formation of lumps). Mix at low speed until batter smooth. Let the batter rest for 2 minutes then pour into the prepared pan. 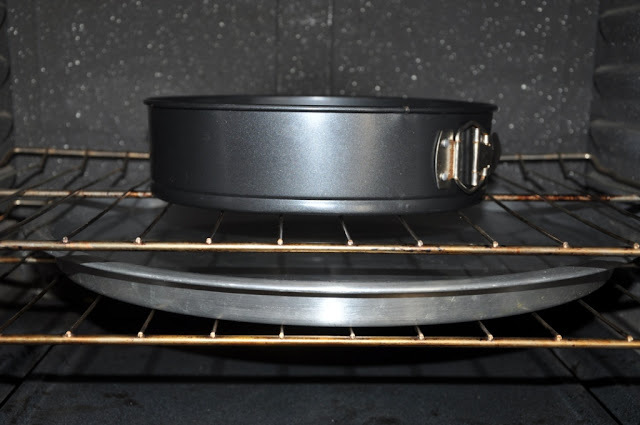 Place two oven racks just on top of each other. On the lower rack, place a large pan filled with boiling water. On the top rack, place the cheesecake pan; center it on top of the lower water-filled pan. Baking the cheesecake in an oven that has a water pan in it helps to reduce cracks on the baked cheesecake. Best backed cheesecake is produced when you bake it in a water bath, this is my version for that! Bake cheesecake for 1 hour and 30 minutes. Close the oven but don't remove the cheesecake pan from it. Leave the cheesecake to gradually cool in the oven for 2 hours. After that carefully run a knife along the outer edges of the pan to separate the cheesecake from the sides of the pan. Leave the cheesecake in the oven for an additional hour. Remove baked cheesecake from oven. If you wish you can trim any rough or browned edges with a sharp knife. Chill cheesecake in the fridge for at least 5 hours before serving. 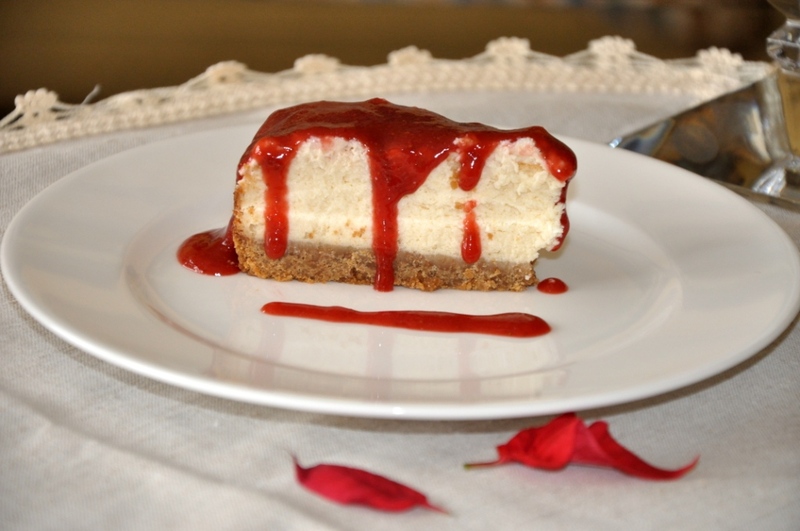 Top with your favorite ready-made cheesecake topping, or with the homemade strawberry sauce recipe on this site. 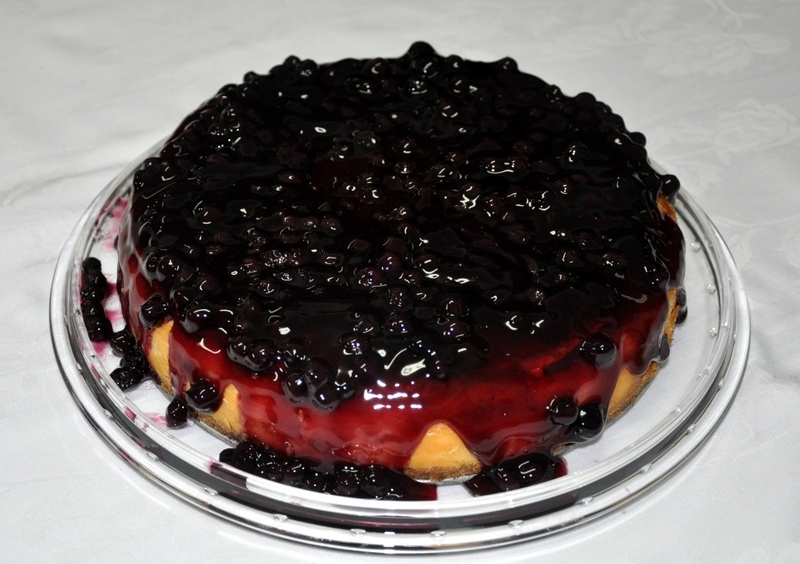 Baked Cheesecake with ready-made Blueberry topping. Hope you enjoyed today's easy sweet recipe: Basic Baked Cheesecake. Bon appetite. Which do you prefer baked cheesecake or the unbaked cheesecake? It's the first time to see a cheescake recipe with water bath. Are you sure we can use Labneh?? Dear Hala, I make it regularly and always with labaneh. As for the water bath, it is recommended to bake most baked cheesecakes in it. most of the recipes actually ask for the pan to be placed in the water tub (similar to cream caramel) but as water can seep into the pan you need to wrap it goo in Aluminum foil. i have found that if you place the cheese cake pan just above the water bath it works perfectly well. The water bath is for the cake not to dry and to minimize cracks on the top of the cake giving you a fine smooth surface. Happy eating:) and hope you post your feedback once to prepare the cake. I live in Amman and I'm wondering what brand of cream cheese and what brand of labaneh you used?